Greyhounds and other pets, as they get older, will often have internal organ failures that go undiagnosed and cause their health to decline possibly resulting in death. The vet may never truly know why, the client may never know why and the costs of continued diagnostic testing can become prohibitive. There is one major organ in the body that can be removed in both humans and animals where they can continue to live an extended period of time. That organ is the spleen. The spleen takes in red blood cells from the blood, cleanses those cells and puts them back into the bloodstream. Sometimes, if something goes awry, the spleen becomes a collector. It absorbs the red blood cells and continues to grow and grow. Sometimes this is the result of cancer, where there may or may not be a growth, and other times it may just have stopped functioning correctly and continues to get larger in its benign state. Through our clinic, we have performed many splenectomies. Some spleens presented in an engorged state, sometimes with a growth, sometimes without a growth, and sometimes hemorrhaging. The surgery, including prep time and close, can last as long as 3 1/2 hours. Sometimes a little longer, sometimes a little shorter, depending on each dog's condition. Just disconnecting the organ from the body can take two hours alone! There are times when an x-ray may be able to detect a very large spleen. Although it is not generally used to find spleen size or even recognize the organ, it is often an inexpensive place to start. Ultrasound is one of the best tools to determine the presence of an enlarged or engorged spleen, but most often, the results presented to us are grossly underestimated. At times we have been told we would see an enlarged spleen and we find that we have something as large as a person's head. Pets that present with grossly enlarged spleens often exhibit inappetence. They are unable to eat their normal amount of food and may vomit. They lose weight slowly but steadily and are often lethargic. The spleen, by being supersized, displaces and puts pressure on all of its surrounding organs. Often the animal becomes dysfunctional. The longer the delay in doing the exploratory surgery necessary to find the anomaly, the less chance there is for survival because of the potential damage to other organs. Although I am not a veterinarian, I am a firm believer in exploratory surgery. During an exploratory, you can not only look at the specific organ in question, in this case the spleen, but you can also inspect other organs for anomalies and biopsy them if necessary. This visualization will often give us the information we need to know how to proceed. There have been a few rare occasions where we have euthanized a dog while in surgery because of what we found during the exploratory. In our experience, once the spleen is removed there is probably a 50% chance that it is malignant. The extended survival of the animal with a malignant spleen could be weeks to months, but much of that time can be good time. Recovery is generally quick and within a number of days the pet is once again feeling comfortable as long as you can get food back into its body. For the 50% that are non-malignant, your pet can gain back weight lost from the spleen removal and move on with life that can go on for years. There is always the risk of the dog dying on the table during surgery but perhaps that is sometimes better than a slow painful death that you have no control over. And here you have become proactive in saving your dog's life. 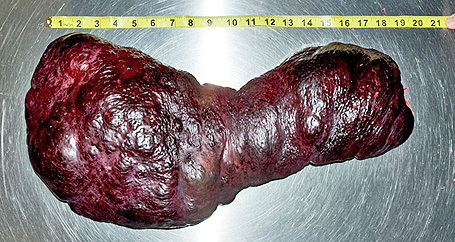 Above: This spleen weighed over 8lbs and was approximately the size of a human head. 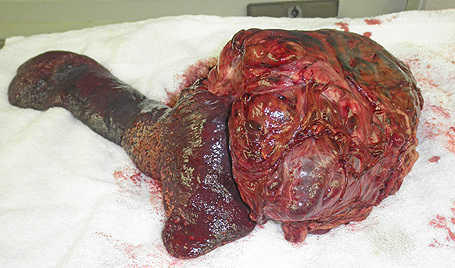 This spleen had a malignant tumor on it. Above: This spleen was the largest we've removed thus far. It weighed 9.6lbs, and measured 21 inches in length, 10 inches in width, and approximately 5 inches in height. That spleen has had a mixed diagnosis of both malignant and non-malignant. The dog is currently recovering.